The Low Down: Evie has had a tough summer. Sure, she got to get away for a bit, but she’s not going to tell her boyfriend, Brandon or her best friend, Mel that it was to a behavioral clinic and not deportment camp. At the end of her sophomore year, Evie started having disturbing visions and crazy hallucinations that seemed so real. Now on medication, she is ready to start her junior year and get back to normal. Her mom doesn’t need to know that she still has horrible dreams and she keeps a sketch book full of alarming drawings. Evie loves her school. Other than a sort of sliding scale of popularity, there are no cliques. This year, however, five transfers from Basin High threatens to upset the balance at school. They speak Cajun French to each other, drive motorcycles, and are rumored to be everything from poverty-stricken and easy (in the girl’s case) to rough, tough, low-class juvies. Much to Evie’s chagrin, Jackson Deveaux, the leader of the pack, always seems to be watching her. Forced to work on a school project together, their sparring is tempered only by short interludes of insult trading. But Evie has bigger problems when her visions return. And in her dreams, there is a red witch who uses thorns and vines to kill her enemies in frightening ways. So much for returning to normal. A week later, the world comes to a screeching halt – just as Evie’s visions foretold. A flash is followed by an unheard of amount of death and destruction. Evie and her mom survive, but Evie’s normally ultra-strong mother is weakened when she is attacked by one of the zombie-like Bagmen. Almost eight months after the Flash, they are running out of food and hope. Then Jackson, of all people, shows up one day on his motorcycle. He has been in the New Orleans militia, but deserted when a larger militia demanded their surrender. They are coming that way and they will take over Haven House and worse. Should they run or stay and take their chances? Evie has finally accepted her visions, but that doesn’t mean she understands them. There is only one person who can tell her what it all means, but she was put in an institution in North Carolina when Evie was a child. If only she can get Jackson to take her there without telling him her awful secrets. But will he trust her enough to make the long and arduous journey through a land that is burned out and filled with Bagmen, militia, cannibals and the desperate? Best Thang ‘Bout It: Wow. The synopsis for this book was the most difficult I have ever had to write. There is SO much going on in this book, it is crazy. How could I get across the storyline without sounding schizophrenic myself? The prologue, which I haven’t even included in my description, seems distinct and almost like it is a separate book altogether (which just adds to the intrigue). And Louisiana, so full of secrets, mystery and dark magic – what a great setting for the story. Mashing together the apocalypse and the tarot is brilliant. The language used in the book elevated an already gripping tale; I really enjoyed the Cajun patois, for true. Of course, the love/hate attraction between Evie and Jack is delicious and has more depth than many will they/won’t they tales. The secondary characters are fully fleshed-out as well. I’m Cranky Because: I have been having some seriously funky dreams since reading this. And, I have to wait for the next installment. Boo. Should You? : Doan be a coo-yôn; be sure to check out this awesome tale before the End is Near. 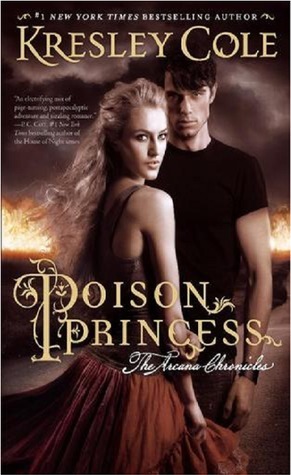 Poison Princess by Kresley Cole was published on October 2, 2012 by Simon & Schuster Books for Young Readers. This sounds good, and your funky dreams have me even more curious! I usually don’t get into bleak, apocalyptic stories…but this one has such a great bunch of twists and layers. As for my dreams, after I really have woken up, they seem to dissipate like the misty fog we had this morning. Oh well – guess there’s not enough room in that part of my brain any more. Too full of phone numbers and trivia. Great! Review! I think I had some crazy dreams after reading this one too! Thanks – I appreciate your stopping by. Can’t wait for the next one. I just might try some of her other stories while I wait!